Director – Marc Forster, Screenplay – Tom McCarthy, Alex Ross Perry & Allison Schroeder, Story – Greg Brooker & Mark Steven Johnson, Producers – Kristin Burr & Brigham Taylor, Photography – Matthias Konigswieser, Music – Jon Brion & Geoff Zanelli, Visual Effects Supervisor – Christopher Lawrence, Animation Supervisor – Michael Eames, Visual Effects – Framestore (Supervisors – Theo Jones, Carlos Monzon & Michael Ralla), Iloura VFX (Supervisor – Glenn Melenhorst), lola VFX, Special Effects Supervisor – Chris Corbould, Production Design – Jennifer Williams. Production Company – 2Dux2. Pooh and all the animals of Hundred Acre Woods feel sad when Christopher Robin is sent away to boarding school. Christopher grows up and marries Evelyn. He then goes away to serve in World War II and returns home to find Evelyn has given birth to their daughter Madeline. After the War, Christopher becomes an efficiency executive at the Winslow luggage company in London. He buries himself in his work, neglecting Evelyn and Madeline. He is opposed to the boss’s son’s suggestion that he make cuts and layoffs. He is given until Monday to come up with an alternate plan but doing so means having to cancel a weekend away in Sussex with Evelyn and Madeline. In Hundred Acre Woods, Pooh wakes up and finds the forest desolate. He passes through a portal in a tree to emerge in London where he is found by Christopher. With Pooh causing chaos in the house, Christopher decides the best option is to take him back to Hundred Acre Woods. There Christopher must help Pooh find Eeyore, Tigger and the other animals while convincing them he is not the dreaded Heffalump. In doing so, he starts to reconnect with the childhood he has forgotten. Christopher Robin is a live-action film loosely based on the Winnie the Pooh stories of A.A. Milne (1882-1956). Milne made up a series of stories to entertain his son Christopher Robin, basing the characters on Christopher Robin’s stuffed toys. Most of the stories can be found collected in two books Winnie the Pooh (1926) and The House at Pooh Corner (1928). Disney purchased the rights to Winnie the Pooh from Milne’s widow and adapted the stories into three theatrically released animated shorts, Winnie the Pooh and the Honey Tree (1966), Winnie the Pooh and the Blustery Day (1968) and Winnie the Pooh and Tigger Too (1974), which were later packaged together as a feature film The Many Adventures of Winnie the Pooh (1977). They also spun off several animated films based around the supporting characters, including The Tigger Movie (2000), Piglet’s Big Movie (2003), Pooh’s Heffalump Movie (2005) and then Winnie the Pooh (2011), and have made some 26 Winnie the Pooh video-released films and four tv specials since 1988. Also of interest is the non-Disney live-action Goodbye Christopher Robin (2017), a biopic of A.A. Milne concerning the creation of Winnie the Pooh, which came out eleven months before this film. Marc Forster is a British director who emerged to some critical acclaim with his third film Monster’s Ball (2001) and then the heavily fictionalised J.M. Barrie biopic Finding Neverland (2004), both of which I found overrated. In between various non-genre films such as The Kite Runner (2004) and Machine Gun Preacher (2011), Forster has been a frequent dabbler in genre material with the deathdream film Stay (2005), the Will Ferrell meta-fiction Stranger Than Fiction (2006), the James Bond film Quantum of Solace (2008) and the zombie film World War Z (2013). Ever since the success of Babe (1995), which took a story that before that would have been told in animation, and rendered it using animatronics, the talking animals film has rediscovered itself in live-action. We have seen efforts such as MouseHunt (1997), Cats & Dogs (2001), Racing Stripes (2005), Beverly Hills Chihuahua (2008), G-Force (2009), Furry Vengeance (2010), Hop (2011) and Zookeeper (2011), all of which would have been animated films if they were made only a couple of decades earlier. Amid this, there have been a host of familiar talking animal stories that have been reworked using animatronics and CGI with 101 Dalmatians (1996), Dr Dolittle (1998), Stuart Little (1999), Animal Farm (1999), Garfield (2004), Charlotte’s Web (2006), Alvin and the Chipmunks (2007), Yogi Bear (2010), Paddington (2014), The Jungle Book (2016), Peter Rabbit (2018), Watership Down (2018), Dumbo (2019) and The Lion King (2019). With the bad taste of the cinematic abortion that was Peter Rabbit still lodged in memory from earlier in the year, I didn’t have high hopes for Christopher Robin. I also had major misgivings about the involvement of Marc Forster, remembering how he had tackled the life of another famous children’s author – that of Peter Pan creator J.M. Barrie in Finding Neverland – where he decided that a made-up story was far more interesting that the biographical truth (one that many people have now come to believe is the real story of Peter Pan’s creation despite the film announcing it is a fiction). 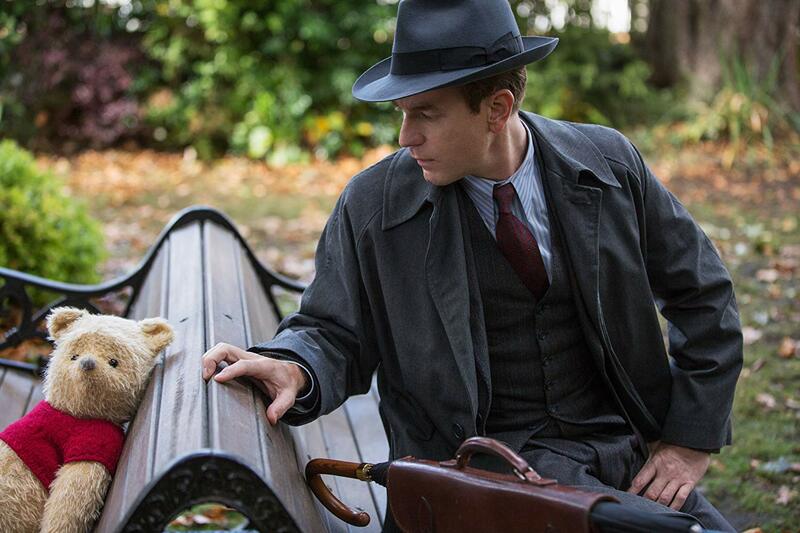 Ewan McGregor’s character in the film is loosely based on Christopher Robin Milne, A.A. Milne’s own son who became the boy character of the Winnie the Pooh books. (Your teeth grate on edge when you see that he has now been rewritten as a character whose surname is Robin). The film’s Christopher Robin has vague similarities to the real Christopher Robin – he served in the War, married not long after and had one daughter, although differs widely in that the film’s character goes to work as an efficiency executive for a luggage firm whereas the real Christopher Robin set up a bookshop. The biggest difference is that the real Christopher Robin welcomed Pooh fans whereas the film has him forget all about Pooh as soon as he leaves home. Christopher Robin essentially steals the plot of Steven Spielberg’s Hook (1991), which had a grown-up Peter Pan being dragged back to a Never Never Land he had forgotten all about. Or perhaps even more so than Hook, you are reminded of Drop Dead Fred (1991) in which a grown-up Phoebe Cates has her world overturned by an annoying imaginary companion from childhood that she had grown up and forgotten about. The script is frustratingly vague about exactly what the animals of Hundred Acre Woods are meant to be – we see them living in a desolate forest, which is meant to represent the death of Christopher Robin’s imagination, but then both Christopher and Madeline are later able to physically enter the woods, while the animals return to the real world and react with and can be seen by other people, which confusingly suggests it is a location that exists in the real world. This is a version of the Winnie the Pooh characters that has been made in the aftermath of the success of Paddington and sequel. Thus we get a good many slapstick scenes with Pooh causing chaos in the house, getting a gramophone horn stuck on his head, running around the train station with a red balloon and a climax involving the characters racing around the streets of London. The film starts to come into its own during the scenes with Ewan McGregor and the animals playing around in the woods, many of which are designed to make you go “awwww”. It is here that you feel Marc Forster gets the essence of what the Pooh stories are about in exactly all the ways that Peter Rabbit failed to do. The filmmakers have abandoned the familiar rounded anthropomorphic look of the Winnie the Pooh and based the designs of the animals on the original toys owned by Christopher Robin Milne (which are now in the New York Public Library). It feels a little odd not having the familiar Pooh characters and instead watching a series of characters that look exactly like they are animated stuffed toys. To the film’s credit, the visual effects and design team have made exacting effort to replicate the E.H. Shepard illustrations for the books in depicting Hundred Acre Woods, Tigger’s house, showing them playing Poohsticks on a meticulous replica of the bridge and so on. The film makes interesting contrast to Goodbye Christopher Robin from a few months earlier, which was drawn from the relationship between A.A. Milne and the real Christopher Robin. Both films have the same core story of a man returned from the war, frustrated in his creative/professional endeavours, having a distant relationship with his wife and how he comes to connect with his young child through the exercise of his imagination in populating Hundred Acre Woods with imaginary characters. On the other hand, Christopher Robin is a film that glibly slides over the issues that Goodbye Christopher Robin has beneath its surface. Here Ewan McGregor survives the war without any of the PTSD that Domhnall Gleeson did in the other film. Goodbye Christopher Robin is about the troubled relationship between man and his creation; Christopher Robin by contrast is all about one man and how he rediscovers his childhood and, as per the Paddington films, unleashes chaos on the city in effect giving the middle finger to his smarmy boss’s son.